Your source for the best punching bags for mma, boxing, kick boxing, Muay Thai, and more! 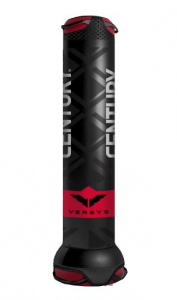 The Century Versys Fight Simulator is an exciting new line of heavy bags developed by Century MMA. The bags were released in late 2013, so they have only been around for a few months. Unlike other free standing bags, the Versys bags have very interesting and unique designs. The VS1 is similar to a regular free standing bag, except it provides a significantly larger striking surface and is also great for ground and pound training. The VS2 is a very unique bag that is designed to specifically practice grappling techniques. We really like the design and uses for both of these bags, but they are definitely different than other heavy bags so you should read the reviews below to make sure they will fit your training needs. The Century Versys VS1 is the most traditional looking heavy bag in Versys line. It comes with a small base that the bag stands up on. 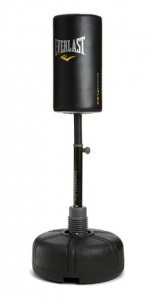 Unlike regular free standing punching bags, the VS1’s base is very small. This provides ample room (it’s 66″ tall) for all kinds of striking from low leg kicks to high punches. The larger striking surface is what really sets the bag apart from others and is one of the reasons we really like the VS1’s unique design. The bag is designed for versatility, and it really does provide a lot more opportunity for all kinds of combat training. You can use the bag for stand up striking and also toss it on the floor to work on your ground and pound training. The bag is designed to move a little when it’s hit and this helps you to work on and develop your speed, timing and accuracy. The Versys line of bags are generally meant for cardio and aerobic training and NOT to develop power. This is because the base is smaller and it may not keep the bag stable enough if you strike it with powerful kicks and even punches. If you want a good bag to develop your endurance then we think the VS1 is a great choice. 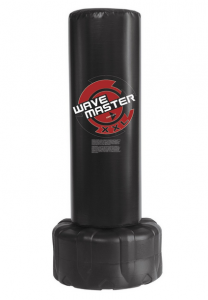 However, if you are looking for a free standing punching bag to develop your power then we’d suggest you check out our Wavemaster XXL review. The Versys VS1 has several other features that we really like. There are two handles on top that you can grab onto when you want to practice knee strikes. This is again a very unique feature that makes practicing striking with knees far easier than a lot of other bags. The bag is also relatively forgiving and has a large diameter with decent padding that can absorb hard punches and kicks. Another very cool feature is that the base of the VS1 comes pre-filled, so you never need to worry about filling or unfilling the bag. This is a huge bonus as Filling (and unfilling) a heavy bag can be both be a pain and can lead to a mess of sand or water if you aren’t careful. The VS1 weighs approximately 110 pounds, so while it’s heavy enough to withstand blows, it’s light enough to drag around a room. This means you can easily move the bag around your house (or gym) and store it when it’s not in use. While the VS1 is designed for all kinds of combat training, the Century Versys VS2 is designed specifically to practice grappling. This becomes obvious by the unique and interesting shape of the bag. The bag has three legs that lead up to the base where two arm like appendages stick out. The special design of the bag allows you to practice a lot of grappling techniques, as well as work on some ground and pound training once you’ve taken it the bag down with a a quick and powerful throw. If you want to practice your grappling techniques we think you will be very pleased with the design of the bag. It is just heavy enough (about 50 pounds) to withstand some force and also practice taking it down. The two arm like appendages allow you to practice many different kinds of moves. You can pretend like the bag is a real opponent and duck under the arms to score a quick and sudden take down. Besides throws, you can practice moves like hip tosses, leg sweeps, leg hook takedowns, and much more. As you can probably tell, the VS2 is really meant for people who want to practice things like BJJ, Judo, wrestling and similar martial arts training. It definitely isn’t a traditional heavy bag and doesn’t serve much value at all if you want to practice your striking with kicks and punches. It is also expensive, so you should be sure that you really want a bag specifically to work on grappling and not much else. We think Century makes excellent products, so if you want a good training bag that will allow you to develop your grappling techniques then we encourage you to check it out. You can definitely get a lot of great uses out of the Versys line of heavy bags. We really like that Century is constantly innovating and providing new styles of equipment that lets people enhance their mixed martial arts training. The VS1 and VS2 are very good bags depending on your training needs and are definitely worth considering. However, they definitely are not meant for everyone. If you want a more traditional heavy bag then take a look at the other reviews we have done on many of the great punching bags from companies like Everlast, Century, UFC and more. Also, we suggest you take a look at our heavy bag reviews chart to see detailed info on many of the top punching bags available from all the big brands. Everlast is one the most popular martial arts equipment brands in the world and they make some of the most well known heavy bags. In this post, we review both the Everlast Omniflex and Everlast PowerCore free standing heavy bags. One of the bags we really liked and think is a great investment, while the other bag didn’t live up to our expectations. Make sure to read the reviews so that you can decide whether either of these punching bags are right for your martial arts training. The Omniflex Free Standing Heavy Bag is made of an interconnected matrix of webbed synthetic leather and vinyl. The bag’s height is adjustable and goes up to 67 inches at its highest setting. The base has a plastic base and can be filled with water or sand. When full, the entire bag and stand weighs 130 poounds. The Omniflex is an interesting choice for a punching bag because it features a flexible neck joint between the base and the bag, which absorbs nearly all of the force of impact. This makes this bag exceptionally forgiving to joints and fists compared to most other free standing heavy bags even when hit with heavy power shots. However, we always recommend gloves be worn when hitting any punching bag. Power hitters will be pleased to see that the base doesn’t move at all regardless of the height setting. Rather, the bag swings back on the flexible neck to a maximum angle of about 30 degrees and then snaps right back into place. This gives the bag a more dynamic feel than most other free standing heavy bags, allowing the striker to work on developing power, timing, cardio and even some basic head movement and uppercuts. Since the Omniflex swings back into place with nearly the same force as it was hit, heavier punches will cause it to actually swing towards the striker, providing an ideal angle for practicing uppercuts and also giving you something to avoid with head movement. On the lowest height adjustment, the Omniflex also allows MMA or Muay Thai fighters to simulate clinch knees effectively, as they can pull the bag down into their knees, essentially replicating the mechanics of pulling an opponent into a knee strike. These are just a few examples of drills that can be done with the Omniflex that cannot be done as effectively with a standard free standing heavy bag. We recommend the Omniflex to a wide variety of users. The bag is a great choice for trained fighters who are looking to supplement their regular training with a dynamic piece of equipment, which can be used for a variety of fight-related drills. We also recommend it for beginner martial artists who are looking to develop power in their technique without concern for injury. The Omniflex is also great for aerobic fitness users who are looking to improve their cardio and relieve some stress. The Omniflex is easy to set up and take apart as well as move into storage. Additionally, since it is a free standing punching bag, you do not need to make any modifications to the room the bag is in and there are no hanging contraptions. Regardless of skill level, we found the Everlast Omniflex Free Standing Heavy Bag to be an excellent investment for martial arts training. It is well designed, durable, sharp looking, and should last a long time. The Everlast PowerCore bag has a very durable surface that is made of a mixture of black synthetic leather and vinyl. Its base, which can be filled with sand or water, is made of high-density plastic. The neck that connects the bag to the base is made of the same material. While this sounds good, we found this to actually be a design flaw and we will address this later on in thew review. 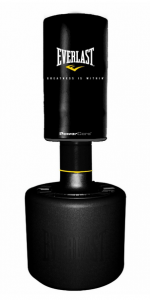 The PowerCore is adjustable in height, standing anywhere from 52 inches to 65 inches tall. The bag and base weigh about 250 pounds in its entirety when full. The bag is convenient and easy to set up, take apart, move, and store. The main feature of the PowerCore punching bag is the set of three metal plates arranged in the core of the bag that help to add stability. The core of the bag is surrounded by a layer of foam, which adds protection and helps disperse force from punches, making the bag somewhat forgiving to a strikers hands. As always, however, users should be careful to wear gloves (especially power punchers). As mentioned earlier, the PowerCore’s neck is made of inflexible dense plastic. Because of the metal plates at the core and force dispersing foam, the design of this bag is such that the neck ends up bearing a significant amount of the impact force. Put frankly, it did not hold up well under pressure when testing it. We have also heard similar complaints from others who have said that the neck may crack after a particularly hard shot, rendering the bag essentially useless. Therefore, while many people see the “Everlast” brand and think it’s designed for power hitters, we actually don’t recommend it to people who have significant power strikes. We also don’t recommend this bag to trained fighters, aspiring fighters, or even larger fitness users who naturally hit harder, as all of these users might damage the PowerCore. Instead this bag could be a good choice for aerobic fitness users who want to improve their cardio conditioning, but won’t hit the bag with powerful punches or kicks. This bag could also be appropriate for children, as it is short enough for many kids on its lowest height setting, and forgiving enough that they shouldn’t hurt themselves when punching it. Everlast products are usually top of the line, but it seems as though nobody is perfect and the PowerCore Free Standing Heavy Bag isn’t a punching bag we highly recommend. 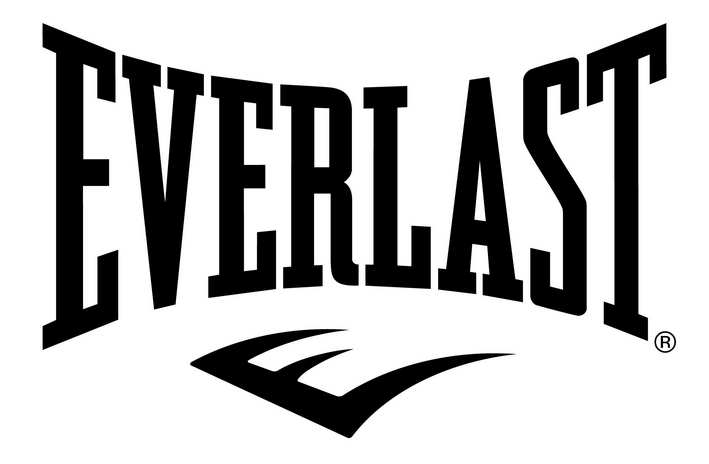 We also have reviewed several other Everlast bags, so if you are looking for a more traditional bag (i.e. hanging), check out our other reviews of Everlast punching bags. The Century Body Opponent Bag, or “Century BOB” is made by Century and is a freestanding heavy bag that comes in regular and XL versions. Unlike traditional circular heavy bags, these punching bags are are designed with a muscular human torso and head that comes complete a glowering, menacing face. 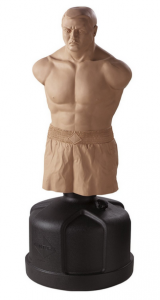 These bags are very popular because they provide as close to a realistic training experience as a punching bag can provide. Read our in depth reviews on both the BOB regular and BOB XL to decide if this is the right bag for your training needs. The BOB bag stands between 60 and 78 inches tall and has 7 adjustable heights. Like other free standing heavy bags, the bag weighs in at approximately 270 pounds with a full base, which can be filled with sand or water. The BOB punching bag itself is fairly stable and doesn’t move around the floor much when hit, although it may rotate on the spot. The polyethylene base is rounded, making BOB easy to roll and store when not in use. BOB’s surface is made out of high-strength plastisol and it is stuffed with high-density urethane foam. This makes the BOB a more accurate representation of the density of a person than other similarly styled free standing heavy bags. BOB’s body is significantly tougher than the head, with the plastic base only reaching the upper torso area. The actual plastisol surface is also little rougher than some other normal heavy bags, so unprotected glancing blows may result in the striker leaving some skin behind. We highly recommend that you use wear gloves while hitting the BOB and to exercise caution when aiming at the various targets. 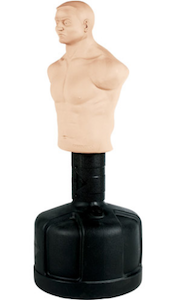 The realistic targets make the BOB stand out from other free standing punching bags. Simply put, BOBs are a more accurate simulation of striking a real person than any other free standing heavy bag on the market. They offer more realistic target practice than any other product, allowing the user to practice striking the head, neck, ribs, and abdomen. We believe that they are not only ideal for martial artists or fighters who want to work on their accuracy, but are also a fun and entertaining alternative for aerobic fitness users who just want to get a good cardio work out. One minor drawback of the BOB is that the body is attached to the base by 6 screws. The screws have the tendency to loosen over the course of a workout. These screws can be re-tightened, however, so we suggest you keep a screw driver handy and make sure to tighten the screws periodically in order to avoid losing them. The other major drawback to the Cenury BOB that we have found is its durability. The foam and plastisol, while effectively simulating a human body, tend not to be as durable as other free standing heavy bags. For example, an exceptionally powerful striker may eventually knock their BOB’s head clean off. Less serious damage might include the nose or other pieces of the face falling off after repeated blows. However, these issues seem to be infrequent and shouldn’t be a major concern. BOB is a little more expensive than other comparable free standing heavy bags. However, we believe that it is worth the extra cash as there is a lot than can be done with this versatile product. If BOB could give a thumbs up, he would, but since he doesn’t have thumbs we will do it for him. The XL is a larger version of the original BOB punching bag. The XL still has the same muscular build and angry face as the original BOB, however, the torso has been extended lower to include thighs. This makes it one of the the largest body punching bags on the market. The bag has two height adjustments that range from 5’6 to 6 feet tall. The bag weighs approximately 270 pounds when the base is full, however the larger size makes the bag a little more stable than the original BOB. The base is made of hard polyethylene plastic and it’s is rounded which makes the it easy to move and store when needed. The XL body opponent bag is made out of high-strength plastisol and is stuffed with high-density urethane foam. This makes striking the bag feel very much similar to striking a person. However, the surface is not as smooth as other heavy bags making it a little rough to strike. As such, we recommend that you strongly consider using gloves when you hitting the bag. The XL improves on the BOB’s novel design by including thighs, which adds to the versatility of the product for MMA fighters or kickboxers who are interested in practicing low kicks on a realistic target. The bag is a more accurate simulation of striking a real person than any other free standing heavy bag that we have used. We believe that it is ideal for serious martial artists and fitness users alike, as the stability allows it to take accurate power shots and combinations from fighters, while cardio fitness users have an amusing target to hit while getting a good workout in. Although Century has improved on the design, the XL still has the same drawbacks that we mentioned in the original BOB review above. The screws in the back that keep the bag secured to the base still have the tendency to loosen after use, so we recommend that you tighten them with a screwdriver from time to time. The bag also has the same durability issues that we discussed, but again, these don’t seem to be a major concern. In general, we found the original BOB to be well-suited for realistic training practice and highly recommend it. However, if you want a bag that also allows you to practice the accuracy of low kicks in combination with the rest of the body’s targets, then the XL punching bag is also a very good choice. If a body opponent bag isn’t something that interests you, then definitely make sure to check out our free standing heavy bag reviews for advice on other great training MMA bags. If you really want to maximize your training or workouts, a hanging heavy bag is an absolute necessity. However, for the majority of martial artists, boxers, and fitness enthusiasts, purchasing a hanging heavy bag is not realistic. A hanging heavy bag requires additional support structures to be installed inside your home. These support structures protect the foundation of your ceiling, allowing you to maximize power kicks and punches without worrying about causing structural damage. These installations can be extremely costly, averaging thousands of dollars, and may take days to complete. The solution to safely training at home for a fraction of the price is a free standing punching bag. They can also usually be easily rolled into place when needed and then quickly stored afterwards. This also makes them an excellent tool for aerobic fitness classes at exercise gyms. Free standing bags vary in size and quality, and as a result some are more recommended for more serious MMA or boxing fighters than others. Made from a variety of materials, the free standing punching bag is supported on a structural base that can be filled with water or sand. Some bases even allow you to secure the punching stand with weight plates. There is an array of benefits to opting for a free standing punching bag as well as a few inconveniences to take into consideration. 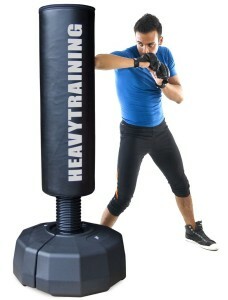 •	The free standing heavy bag is one of the most convenient ways to work out and train. Since the heavy bag is not secured to a ceiling fixture, you are able to move it around your home and store it appropriately. If you are a personal trainer and want to use the free standing punching bag with a client, you can easily transport it to your studio or client’s home. •	Although quality can vary depending on the brand, free standing punching bags overall are very durable. The outside material may be synthetic leather, vinyl, rubber, or a combination of all three. Popular brands are built to be used by professional martial artists and therefore are made to absorb thousands upon thousands of kicks and punches. •	Since you don’t have to worry about installing a ceiling support beam, you will be saving yourself a lot of money with a free standing punching bag. Also, as mentioned above, the durability of the punching bag will ensure that it can be used for years to come. •	Again, this will depend heavily on the brand, but you may find that some free standing punching bags are not supported in a stable fashion to allow for optimal training or workouts. Sloshing water or uneven sand within the base of the foundation may cause issues. •	Continuing with the idea above, some free standing punching bags are not able to withstand full power kicks and punches as the bag may topple over. Be sure to read carefully when purchasing a bag to ensure it will be able to absorb a high percentage of pressure per square inch. 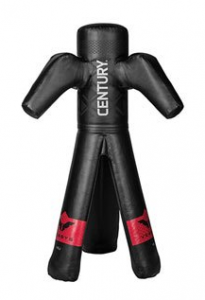 The BOB Heavy Bag from Century is one of the best free standing punching bags on the market. Not only is the striking surface made with an extremely durable rubber material but also the base is constructed from a hard plastic and PVC combination. BOB can be filled with sand or water, weighing up to 275 pounds. Your hardest kicks and punches won’t phase this realistic training tool. Best of all, it comes with a great manufacturer’s warranty. The main feature of the Century Heavy Bag is the human shape allowing you a realistic training while still maintaining a over average durability of the material used. We therefore highly recommend the Century BOB for all boxing enthusiasts wanting to invest in a product from the world largest manufacturer of martial arts and fitness apparel. The Everlast Omniflex free standing heavy bag is constructed from a durable, webbed, interconnected matrix of black synthetic leather and vinyl. The bag is 67 inches tall at its highest setting. The plastic base can be filled with water or sand, with the entire apparatus weighing in at around 130 lbs when filled. The main feature of the Everlast Heavy Bag is the flexible neck on which the bag sits. This allows the bag to swing back at an angle of around 30 degrees on impact and then quickly spring back to its original position, without the base moving noticeably. This allows the bag to absorb significantly more force than most free standing punching bags. It also allows for wider functionality as uppercuts can also be trained on this bag, which is not something that can commonly be trained on most heavy bags. On its shortest setting it can also be hit with knees. We highly recommend the Everlast Omniflex bag as a good supplement for trained fighters looking to work on cardio, power, reaction time, and also some basic head movement (the bag snaps back into place with close to the same force as it was hit, which means that it could potentially hit you in the face after a well committed punch or haymaker). We also recommend it for aerobic fitness users looking for a fun way to let off some steam without fear of injury. It is well designed, long lasting and and in our opinion quite simply an excellent investment. The Original Century Wavemaster Freestanding Heavy Bag is the first standing heavy bag that Century released over a decade ago, and is a staple at many martial arts gyms. It is the predecessor to an entire line of Wavemasters, each of which are based on the original with various improvements on its design. The free standing heavy bag is made of high-density, force dispersing foam with a durable, long lasting vinyl cover. It stands between 47 and 68 inches tall depending on the height setting. The base can be filled with sand or water. The entire apparatus weighs around 250 pounds, and is available in red, blue, or black. This bag is fairly stable, and somewhat padded, but is not as forgiving as more padded standing heavy bags and could potentially lead to foot or ankle injuries if kicked too hard or improperly. The bag is smaller than most freestanding heavy bags and so we recommend this bag to shorter adults and children, who will find it more stable when adjusted to a shorter height. As well, we recommend it to aerobic fitness users as a good cardio training tool. However, we would not highly recommend it to people over 6 feet tall, as it becomes wobbly and unstable when adjusted to their height and may slide along the training surface, or worse tip over. It is also significantly nosier to hit at this height. You can read more reviews about other Wavemaster bags here. The Everlast PowerCore free standing heavy bag has a shell that is constructed from a durable mixture of black synthetic leather and vinyl. It has a series of three metal plates at the core of the bag, which serve to contribute to the stability of the overall bag, with foam providing protection and force dispersion on the surface. The punching bag has a high density plastic neck and base, which can be filled with sand or water. The bag is adjustable in height and ranges from 52 inches to 65 inches. It is also easy to assemble and store and weighs in at approximately 250 pounds when filled. The Everlast bag is relatively forgiving, and the surface of the bag is fairly durable, however it does have one significant design flaw. With a name like PowerCore, we would expect this heavy bag to be able to take powerful strikes, but this is in fact a misnomer. The problem with the bag is that the plastic neck has the tendency to crack from the force of powerful strikes. The bag was simply not designed to take hard shots, rather it was designed with aerobic fitness users in mind. Therefore, we would recommend it to aerobic fitness users as it serves that purpose well enough. However, we would not recommend this to aspiring MMA or Boxing fighters who are interested in developing power in their punches and kicks or even to larger fitness users who naturally pack a stronger punch. This bag simply cannot take the punishment. 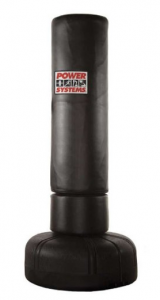 The Power Systems PowerForce free standing punching bag is one of the largest free standing bags on the market. It stands a colossal 72 inches tall, and has a 16.5 inch diameter. The bag’s cover is a mixture of nylon and canvas and weighs well over 300 pounds when the base is full. The padding is thick, however because of the size, weight and material, we would heavily recommend that users wear at least 12 oz. gloves when hitting this bag. An excellent feature of this bag is that it contains a heavy-duty rubber coil in its two-piece base, and a removable collar that allows the bag to swivel more when hit, making this bag exceptionally stable. In this mode, it will not move around the floor at all even when hit with power shots. With the collar in place, the PowerForce bag is still very stable as it just snaps back into place after punches faster, making this mode more ideal for combination punching. We recommend this bag to aerobic fitness users and serious fighters alike, as it serves both of these groups well. This bag is a little more difficult to set up and move around than other freestanding heavy bags because of its size and recoil spring, so some assistance is probably necessary in the setup phase. It is also more expensive than most other standing bags, however its size, stability and durability are well worth the extra money. The Ultimate Fighting Championship, or UFC, is known primarily as a mixed martial arts promotion, but what many people don’t know is that they also produce MMA gear under the UFC brand. Like any other company, the UFC heavy bags run the range from ok to great and in the article below we review 4 of their top heavy bags. Make sure to read all the reviews so that you can decide if a UFC punching bag is right for you. The UFC 100 lb. Competition Oversized Heavy Bag is a standard weight punching bag similar to other bags that you might find in any boxing or MMA gym. The bag is constructed from durable vinyl and filled with synthetic fiber. It is available in black with the UFC logo in red letters. The bag hangs from a solid steel chain assembly with a ring at the top. This helps to ensure that the chains do not get tangled and makes for an easier hanging process. What separates this bag from most standard punching bags is its dimensions. The bag is 52 inches tall and has a large diameter of 16 inches, making it one of the fatter 100 pound heavy bags on the market. Because of these dimensions, and the synthetic fiber filing, the bag is relatively stable and very forgiving. As such, we recommend this bag to aerobic fitness users as well as MMA athletes who wish to work on kicks and knees as well as punches. Its wide diameter creates a larger striking surface area, which really lets the striker to dig their shin into the bag, helping them to build their kicking power. The synthetic filler is not packed too tightly making the bag a little on the softer side. However the filler does have the tendency to settle to the bottom a little bit after regular use, although not dramatically. This means that the bottom might get a little harder than the top, but not so much that it hitting it would cause injury as long as proper precaution is taken. We really like this UFC heavy bag and recommend it highly. The UFC OcTek MMA heavy bag is on the lighter side of heavy bags, but still not the smallest that you might find. It is constructed from synthetic “OcTek” material, which is an strong interlocking woven vinyl material, and is filled with a mixture of shredded cotton fiber and sand, making it very forgiving, yet still stable. Rather than being suspended by chains, this UFC heavy bag is hung by the so-called “Flex4” suspension system, which are four hard compound rubber straps that makes for easy setup, provides less noise than a bag hung by a chain, and also adds to the bag’s overall stability. These two features are excellent touches, which simply illustrate how well designed this training bag is, as most bags less than 100 pounds tend to lack the stability requirements for most adult MMA fighters. 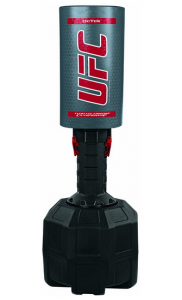 The UFC punching bag is made from durable long-lasting material that doesn’t dent easily. The oversized diameter gives this bag a larger striking surface, which makes the UFC OcTek MMA Heavy Bag ideal for a variety of strikes — not just punches, but also kicks, knees and elbows. We recommend this bag to aerobic-fitness users because it is light and forgiving, but also provides some resistance. We also recommend it to aspiring MMA fighters who are looking to develop their technique on steady punching bags without injury. 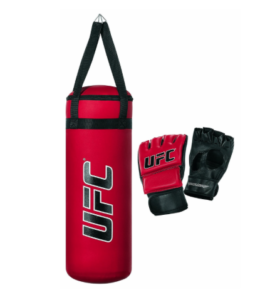 The UFC Youth MMA Training Punching Bag Set comes complete with a 9 pound punching bag, a heavy gauge zinc plated steel heavy bag mounting system, and a pair of MMA training gloves. The 9 pound bag is available in black with the UFC logo in large red letters. It is perfect for younger boxers wanting to improve their sparring techniques. fighters hand and offer enough protection for aerobic-fitness users who want to experience the novelty of wearing UFC brand MMA gloves while exercising, however they do not provide enough protection for serious fighters or power hitters. For these users, we would recommend getting bag gloves that offer a little more protection. The bag itself is ideal for aerobic fitness users who want to get a good workout in, as well as children and lighter fighters. It is an excellent size for wrestling drills that involve lifting and carrying a punching bag over any distance, which is something that MMA fighters might find themselves doing in training from time to time. Heavier young fighters (160 lbs and up), however, should consider purchasing a heavier bag UFC bag (or another brand) in order to properly develop power in their shots as 9 pounds is too light to offer the necessary resistance. The UFC Training Station is a free standing heavy bag, which is adjustable in height, ranging from 51 inches to 67 inches. The shell of the bag portion is constructed of OcTek material, which is a strong interlocking woven vinyl material. Under the shell you will find a matrix of force dispersing closed cell polyurethane memory foam style padding. The hard plastic base features core strengthening stations and resistance band channels (although it does not come with resistance bands), making this not only a training bag but a full “training station”. Unfortunately, because of these extra features, as well as some design issues, this UFC bag has a number of drawbacks that might dissuade serious MMA fighters from purchasing it. As a free standing heavy bag, it provides enough padding for aerobic fitness users to strike with hand protection, however we would not recommend it for heavy power kicking as these strikes will go right through and reach the hard plastic centre, which could lead to potential injury. The filling assembly has some water leaking issues, and a common complaint is that some of the plastic pieces, such as the height adjusting insert or the plastic screws, tend to break after repeated use. The extra workout features also tend to break down after heavy impact. Therefore, we would not recommend this UFC training bag to serious fighters. Aerobic fitness users may enjoy the size and shape of the bag, so this could be a consideration for them. If you are looking for one of the best free standing heavy bags, check out our other Free Standing Heavy Bag Reviews. Once assembled, the XXL weighs in at approximately 270 pounds, which includes the weight of the base. With a diameter of 18 inches and a height of 69 inches, the XXL is easily one of the largest free standing heavy bags available on the market today. In fact, the XXL’s size is what separates it from the rest of the heavy bags in the Wavemaster line. Other Wavemaster products are significantly smaller and, although they tend to be adjustable in height, we do not find them to be nearly as stable as the XXL. The XXL’s superior stability allows for a wider variety of uses, which is one of the main reason this punching bag is great for both recreational users and also serious martial artists and fighters. The XXL is a newer model compared to other bags in the Wavermaster line and it was designed to be easier to fill. Water is the most common filling choice for free standing heavy bags and Century made sure that the XXL’s base is less likely to splash out of the filling cap. This helps to avoid getting the training surface wet, which could potentially be a safety issue. We do find the plastic base to be a little high for small children who run the risk of missing the padding and injuring their toes. Parents and martial arts instructors who teach kids classes should take this into consideration before allowing smaller children to hit this bag. However, as long as you are careful this shouldn’t be a problem. Free standing heavy bags are perfect for home use, as they do not require a large training space, nor do they require any modification to the room. At the same time, they are easier to fill/unfill and also roll, which makes them dramatically easier to store when compared to traditional punching bags. It is for this reason that we would recommend the Century Wavemaster XXL training bag to people who are looking for something that can be used at home and don’t want to hang a heavy bag from the ceiling. The XXL is also excellent for cardio-based exercise classes at fitness gyms, as they can easily be rolled out when needed and then put away when the class is done. The XXL makes an excellent addition to any aerobic-kick boxing class, as the primary function of a free standing heavy bag is to develop cardio. Most other smaller free standing heavy bags would not necessarily meet the stability requirements necessary to train fighters who are looking to compete in MMA or boxing. However, since the XXL’s size and stability allow it to stand up to power shots better than most standing punching bags, we recommend it to aspiring fighters as an excellent supplement to their training. With adequate space, a fighter can practice drills using their footwork with an emphasis on circling or angles against a stationary target and then apply these drills in sparring practice or in fights. Distance and timing, however, are not as much of a factor with free standing bags when compared to hanging bags because they remain stationary. This is why we suggest the XXL punching bag as a supplement for people training to be fighters, in addition to their more dynamic hanging heavy bag workouts. For the best stability, we have found that it is best to fill the XXL with sand. Water will inevitability move back and forth with each punch or kick, which may cause the XXL to move across the floor and potentially tip over. Filling the XXL with sand will ensure a much more stable base, alleviating the concern of punching or kicking too hard. Sand also removes the concern for storing the XXL in a hot or cold environment. We would not recommend storing the punching bag outside exposed to weather; however, it is possible to place it within a garage or basement setting. If you were to fill the base with water and let it sit in an area with a low temperature, the water will freeze and potentially crack the hard plastic base. Sand eliminates this possibility as it works well with extreme temperatures. If you live in an apartment or close quarters neighborhood, the noise level of the XXL may become a problem depending on the surface you place it on. We would recommend a carpet or very padded surface. Placing the punching bag on concrete, hard wood, or tile has been found to be extremely noisy as the XXL may move across the floor or the base may constantly be moving in an up-and-down fashion, producing a consistent knocking noise. Also, placing the XXL on hardwood or tile may damage the surface. 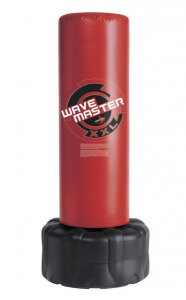 It’s also very important to note that the Wavemaster XXL is not a completely rigid punching bag. The striking surface moves with punches and kicks for a number of reasons. First and foremost, if you were to strike a completely rigid, unmoving stand, the risk of the base and/or padding holder (the plastic piece within the padded surface) breaking would increase significantly. The XXL has a slight ebb and flow of movement to disperse impact tension equally throughout. Secondly, a moving bag is far more realistic to hanging heavy bag, which are the most ideal for training. Thirdly, when fighting an opponent, he/she will not be staying still. Training with a bag that moves in response to your strikes is ideal for developing realistic strikes and fighting techniques. 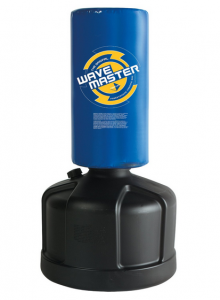 In many ways the Wavemaster XXL punching bag is the ideal free standing heavy bag and while expensive, we believe the bag provides very good value for both recreational fitness users and serious martial artists alike. However, there are a few other Century Wavemaster heavy bags you may want to consider. These include the Original, Powerline, Cardio and Kid Kick. The Wavemaster xxl scoring zones is the newborn from Century. It allows a more precise training with the help of differents scoring zones displayed on the punching bag. You can use it for both kicking and punching for heads and body shots. It remains a heavy bag with a weight of 270 pounds when filled. 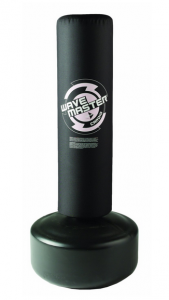 The Original Wavemaster is the first Wavemaster punching bag that Century released over a decade ago. This bag is significantly smaller and not nearly as padded as the XXL. While a very good bag itself, well trained martial artists or people with significant power may find the padding on this bag inadequate. The Powerline Wavemaster was developed for power hitters who want the benefits of a free standing heavy bag, but with additional padding. It has double the padding of the Original, and although adjustable, it is still significantly smaller than the XXL, which means it’s not as versatile of a bag. The Cardio Wavemaster is much softer to strike than the Original model, however, since it is clearly intended for aerobic workouts, it lacks the stability necessary for developing power. This punching bag should only be used in pure cardio workouts where significant power in kicks and punches isn’t used. The only other Wavemaster to consider is the Kid Kick Wavemaster. As the name implies though, this bag is designed for kids. It is significantly smaller than the Original and it is also based much closer to the ground, which makes it an ideal choice for kids who are too small for other bags. Several brands make free standing heavy bags that compete with the XXL training bag, including Everlast, Title and Ringside and even the UFC. There are many different bags that range in size, price and quality. You can also check out our complete Century Wavemaster reviews for more information on other great products. Century MMA was founded in 1982 and is one of the world’s largest martial arts accessory brands. Century has been making several very highly rated heavy bags for many years. We go in depth with four Century Wavemaster punching bag reviews, including the Original, Powerline, XXL and Cardio. 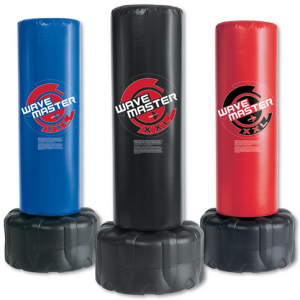 Wavemaster free standing punching bags have several advantages. First, they require significantly less space than a hanging heavy bag because they do not swing. Second, they are easier to set up as they do not require a hanging apparatus or any modification to the room. This also means that there are no concerns about the bag falling from the ceiling due to improper installation. Finally, Century heavy bags have rounded bases, so they can be more easily moved, which is good if you don’t have a set space for your training equipment. 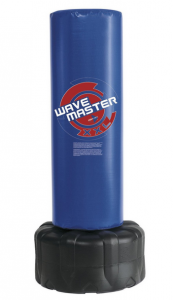 The original Wavemaster punching bag comes equipped with high-density foam and a vinyl cover. One of the advantages that this free standing bag has is that the height is adjustable and ranges from 47 to 68 inches tall. This makes the bag good for people of various heights. The base can be filled with either sand or water, and when it’s full it weighs approximately 250 pounds. The heavy bag comes in several vibrant colors, including red, blue and black. The vinyl cover is built to be heavy duty and durable, which means that you can expect it to be reliable and last a long time without getting and tears or holes. However, it can also be tough on the hands so we strongly recommend you wear proper hand protection before punching it. The bag comes with a foam filler that is designed to absorb the force from punches and kicks evenly, which helps to keep the bag stable and yet forgiving. One important thing to note though is that it’s not as padded as some other free standing heavy bags, and could potentially lead to foot or ankle injuries if kicked improperly or too hard. This bag is smaller and thinner (diameter is just 13 inches) than many other free standing heavy bags, so if you are a bigger person or have powerful kicks you may want to go with another heavy bag like the Powerline or XXL, which are both reviewed below. The Original is ideal for shorter adults and children because it is more stable when adjusted to a shorter height. People over 6 feet tall will find it wobbly and unstable when adjusted to their height. Another downside is that the bag will be nosier to hit when it’s extended to it’s limit. The Century Wavemaster Powerline is very similar to the Original. The bag is available in the same colors, has the same adjustable height (47-68 inches), similar vinyl cover, is well-built, and more. However, the one major difference is that the Powerline has much thicker padding than the Original, so it has a bigger diameter of 17.5 inches. If you have powerful kicks then the Original’s padding might not be enough and you can hurt your feet. The Powerline is designed to solve this problem by providing enough padding to absorb heavy kicks. If you have strong kicks or are advanced at martial arts then you should strongly consider getting this bag over the Original. You can also check out the XXL, which is an even bigger option than either the Powerline or the Original. 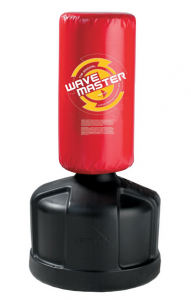 The Century Wavemaster XXL punching bag is free standing and comes with a vinyl cover and high-density foam filler. The bag stands 69 inches tall and is 18 inches in diameter, which gives it a larger surface area than many other products on the market. Unlike the Original; however, the height is not adjustable. The base can be filled with either sand or water, and when full weighs around 270 pounds. The XXL comes in Red, Blue, and Black, so you have the option to choose the color you like most. The vinyl cover is heavy duty and durable, meaning that this should be resistant to heavy striking and long lasting. However, just like the Original, gloves are recommended so that you don’t cut up your knuckles when punching the bag. The foam filler in the bag is designed to specifically disperse force evenly, which keeps the heavy bag stable. Because of the heavy base, as well as its size, this bag does not move very much, which makes it one of the more stable free standing heavy bags available. 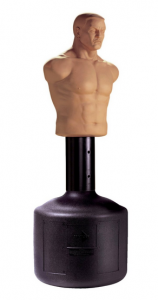 This punching bag is good for martial artists who are working on basic technique with some resistance and is ideal for both home use and at a martial arts or fitness gym. However, experienced fighters training for boxing, or MMA might want a more dynamic, hanging punching bag. You can see the full XXL heavy bag review here. 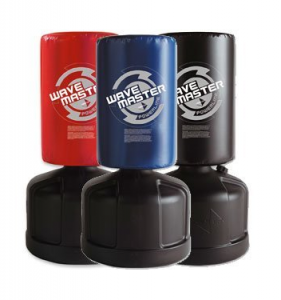 Like other heavy bags in the Wavemaster line, the Cardio punching bag is a free standing bag that comes with high-density foam filler and a strong vinyl cover. It has four height adjustments that ranges between 53 to 65 inches, which makes the bag good for people of differing heights. The bag also comes in red, blue and black. Unlike the other bags; however, the Cardio Wavemaster punching bag is much smaller with a diameter of 10.5 inches. It also weighs considerably less at roughly 170 pounds, including the base. The reason it’s smaller and lighter is because it was designed for cardio work and not for developing strength or power. The bag can be very effective for cardio training, but it is much less stable so you don’t want to be hitting it with powerful punches or kicks. If you want to work on strength or power then you should consider the Original, Powerline, XXL or another heavy bag from a different brand. If you want a free standing bag, but aren’t sold on one in the Wavemaster line then definitely check out our other reviews. We review some of the top free standing heavy bags from several different MMA brands like Everlast, Ringside, Title and more.